Oh. My. God. Sure there’s the architectural marvel of the world’s largest Easter egg. But we’re talking about CHOCOLATE now. In 2005, the people of Guylian lovingly created an object of flocks of further fantasies with this big beauty. All it took was 26 master chefs, 8 days and 50,000 Guylian praline chocolate bars. It was built in Belgium (where else?) Oh, and YUM! 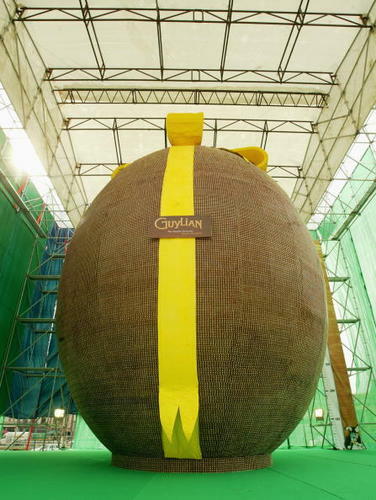 Conclusion: The World’s Largest Edible Easter Egg weighs more than me. This entry was posted in Uncategorized on April 1, 2010 by fatchicksings.